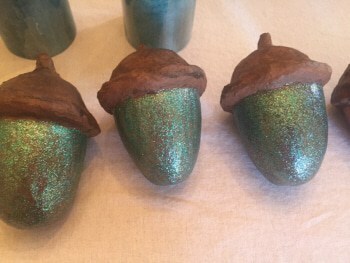 We have a guest post today from Kirk Davies, who made a lovely acorn centerpiece with paper mache clay. This idea would work for any fall or winter table, when you need some really special decorations. They could be used on a mantle, too. I really like how Kirk used a mixture of chalkboard black and two different colors of glittered craft paint to add additional interest to the paper mache acorns. Thanks, Kirk, for showing us how you did it! Last year we jokingly told our friends they didn’t need to bring anything for Thanksgiving dinner, “just bring a centerpiece,” we said. Well, they made a very nice centerpiece, handmade from reclaimed wood. This year we were invited to their home for dinner, so the challenge was reissued. I used Jonni’s paper clay to make ours. It was a first time for me making anything quite like this. I bought paper mache eggs at Hobby Lobby. Then I made toppers for the eggs. First, I tried doing it with cupcake liners, with tissue rolled around the edges, all wrapped in tape. I got smarter and used the cupcake liners, then covered that with aluminum foil…much easier. I then applied the clay. It wasn’t hard. But I’m still an amateur. I varied the sizes of the stems for variety. I dried them in front of a fan, which moved along the process. After they dried, put some painters tape on to protect the tops. I then spray painted some of the bottoms with chalkboard paint. These will be used to write sayings on, or names for place settings. I then painted the eggs with craft paint. I used browns, and then made sort of a black glaze (mixed black and a little water), brushed that on then wiped it off with a cloth to give it a more textured look. The bottoms were painted with plain brown, then I painted them with glittered craft paint. Some were copper, and some were done with two shades of patina green/blue. After a few coats of the glitter paint, then looked pretty good. The last pictures with the candles lit are from their Thanksgiving table. My goal was to make something that looked good, but that kids could handle without worrying. This really fit the bill. I can imagine kids drawing or writing on the chalkboard eggs, which would really be fun and would make the centerpiece even better. 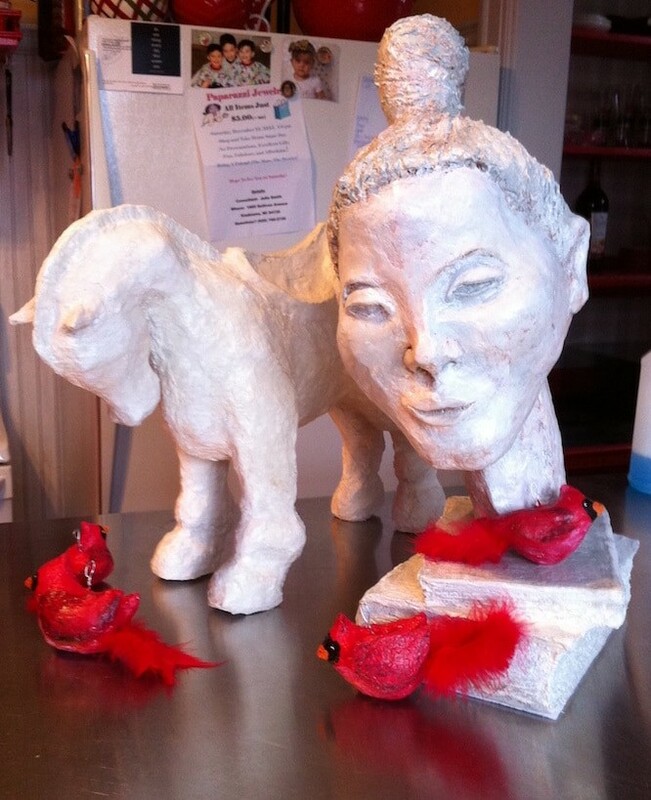 I came across your videos on YouTube and fell in love with your work, so I ordered your “Make Animal Sculptures with Paper Mache Clay” book to use for my Nature Journaling class that I teach for the local homeschooled children in my hometown. We are making robins, but I was also inspired to make some family members gifts for Christmas. I wanted to share some of my creations with you. Happy Holidays! Very nicely done, Mary. I can see you’re having fun with the material. How are the kids doing with their robins? Thank you! The kids are doing very well, and they’re enjoying it so much we are going to do a fox for our Wisconsin animal project. 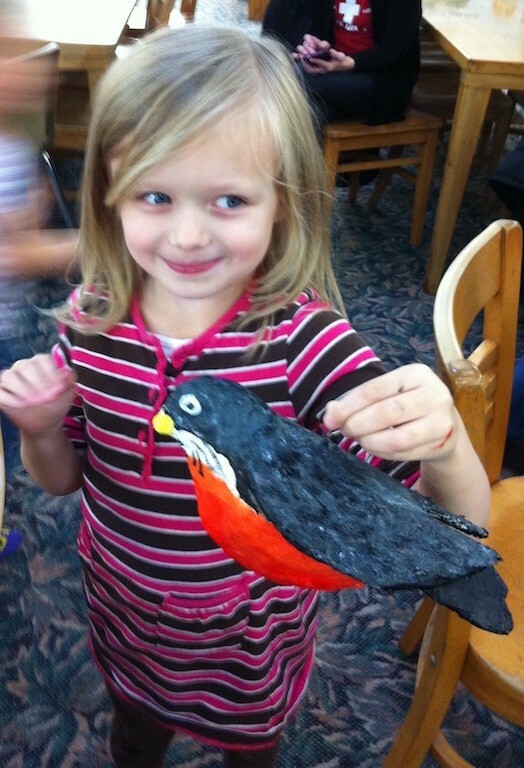 I attached a picture of the youngest student and her robin. Awww – they’re both adorable! Nice job Kirk! Thanks for sharing! Kirk, this is a smashingly great idea. I can see this being a hit with your friends. I love the rustic feel to the pieces. Thanks Christine. That is the look I was going for! Our friends loved it. Hope you have a Merry Christmas.